At about 8:15 this morning, Highland Park police became involved in a pursuit of a minivan that entered the city limits of Dallas. Highland Park terminated the pursuit however the suspect vehicle was subsequently involved in a collision. A witness was stopped facing southbound at the stop sign on Homer St. at Monticello Ave. and observed the suspect vehicle run the stop sign and collide with a vehicle being driven by Mrs. Sandy Vasquez L/F 40yrs old, which was westbound on Monticello Ave. Her son, Ethan Vasquez L/M 13yrs old, was a passenger in the vehicle. Because of the impact, Mrs. Vasquez’s vehicle also collided with the witness’ vehicle. When the witness attempted to attend to the victim, the suspect or suspects fled on foot. 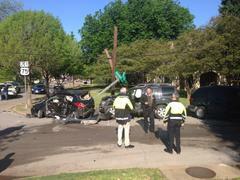 Mrs. Vasquez and her son were taken to Baylor Hospital. Ethan Vasquez was pronounced deceased shortly after arrival and Mrs. Vasquez remains in critical condition. A check of the suspect vehicle indicates that it was reported stolen in late March. We currently do not have a suspect description to release and there were no suspects on the report listing the suspect vehicle as stolen. Because the suspects were in the act of committing a felony at the time of the collision, homicide detectives with the Dallas Police Department are investigating this as a Capital Murder offense. Detectives believe that there are additional people who saw the suspects flee the scene. Additional potential witnesses were visible on in-car video obtained from Highland Park police vehicles. Anyone with information is asked to call Dallas police homicide detectives at 214.671.3661. Crime Stoppers is offering up to $5000 reward for information leading to an arrest and indictment of the people responsible for this crime. Anyone with information is encouraged to call 214.373.TIPS (8477).